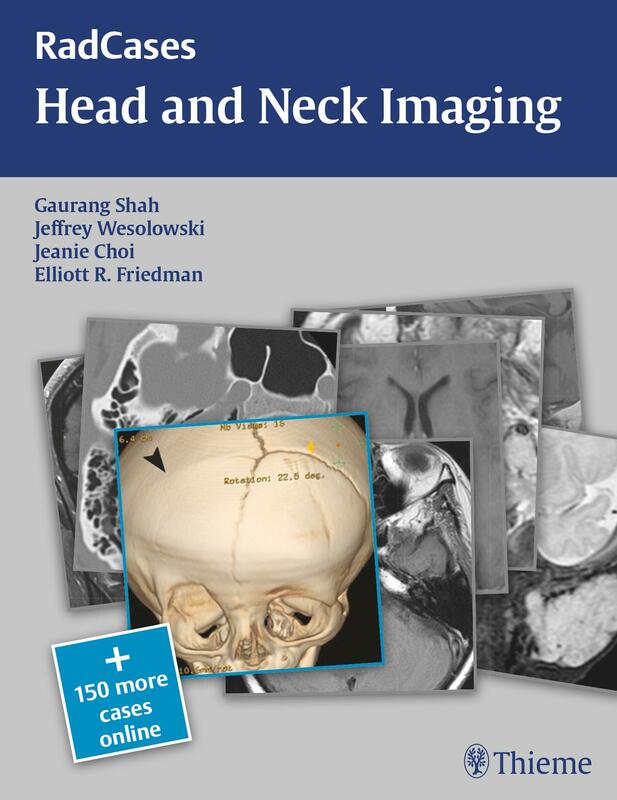 The Head and Neck Imaging of RadCases series from Thieme is a review guide primarily aimed at radiology trainees who will find it useful when revising for their specialty exam. The book presents 100 clinical cases covering a variety of conditions. What I like about the selection of cases is that there is no repetition. The cases illustrate the important differential diagnosis for a lesion in a specific anatomical site. This helps consolidate the important features when making a diagnosis. The format is simple and helpful. Each case begins with a collection of images and a brief clinical presentation. On the next page, it takes the reader through the image findings, discusses differential diagnosis and presents essential facts about the clinical case. Pearls and pitfalls are added to help one appreciate the subtle differences between differential diagnoses and highlight the importance of making the correct diagnosis. In addition to the 100 cases discussed in the book, you also get online access to another 150 cases. The website registration process is simple. Scratch off to reveal the code on the inside of the front cover and enter it on the RadCases website. Type in your name, email address and password and you’re up and running. The website allows you to choose cases by number or view them randomly. A search facility is also available. The tabs follow the format of the book and are easy to navigate. When revising, you can either tag a case as mastered or add it to your revision list so you can revisit it later. It is a little disappointing that online access is available for only a year. I preferred the online content with the ability to enlarge the images online, which is helpful given that some of the images in the book are on the small side. They could have made better use of the available page space when it comes to image size. Despite a few typos and an occasional error (e.g. it should read medial rather than lateral rectus in case 1), the book is nevertheless very well written. The content is succinct but comprehensive. It is well supported by a further reading section and references. At this price, it’s a gem of a book. It should appeal to trainees in ENT, ophthalmology and maxillofacial surgery.